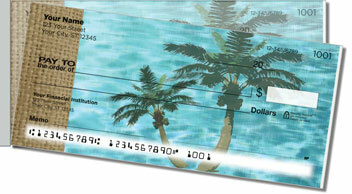 Put the serenity of a tropical vacation in your pocketbook with a set of these stylish Peaceful Palm Tree Checks from CheckAdvantage. 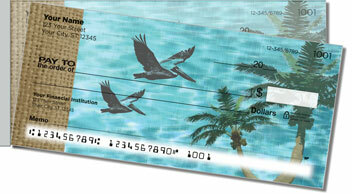 With their "burlap" border, aquatic color scheme and simple tree and water fowl renderings, these checks look like a scrapbook commemorating a romantic getaway! 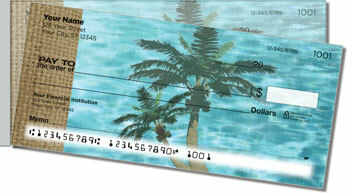 But you'll love our Peaceful Palm Tree Side Tear Checks for more than just their relaxed graphics. Their real value lies in the short-side perforation, which makes it easy to separate your completed documents quickly and cleanly, without accidental rips. 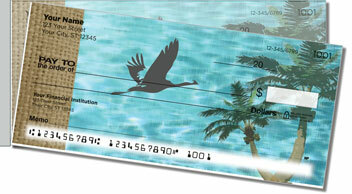 You can also order this collection as a set of return address labels to match your new checks. Make both products yours today!